Instead of taking a second mortgage out on your house or selling all your personal goods, think about asking a friend or family member for a loan. Although having such a conversation isn’t necessarily one you may be looking forward to, you’ll never know if you don’t ask. More so, the loan doesn’t have to be without interest – as long as it’s lower than that of the bank, you’re good to go! Having a previous relationship with friends or family means it may be easier to convince them to lend you cash than it would be convincing the bank. Afterall, your buddy can’t perform a credit check or evaluate your financial history prior to making their decision. If you qualify for a credit card, then this option may be the one for you. 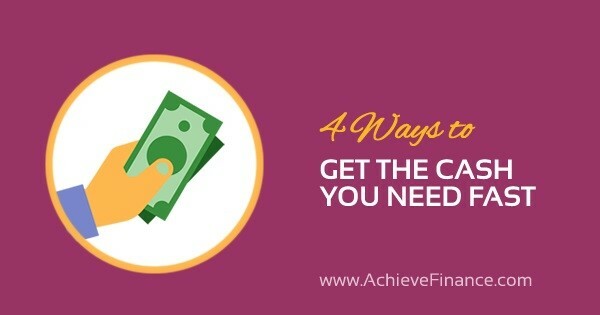 If your cash emergency is short-term and you have a stable income, obtaining a credit card can be a good idea – especially if you can get a low interest rate. A credit card not only allows you to pay for your essentials but equally buys you time in paying back your debt. Physically receiving the credit card after the application process may take a few days though, so make sure you keep that in mind. Leveraging the equity in your home is another option, especially if the emergency is truly short-term. The latter is a credit line that is extended to a homeowner and uses your home as a collateral. Of course, the amount of obtained cash depends on your home’s value, remaining mortgage balance, household income as well as your credit score. This option allows you to either receive the maximum amount of allotted cash or just enough to cover your needs. The cost to establishing and maintaining the home equity line of credit is your responsibility, however. You can learn more about these here. You can select your own repayment schedule by setting it for less than 10 years or more than 20 – either way, the balance in full must be paid for by the end of the loan term. Of course, you will still pay interest in this scenario however it is possible to have the latter deducted from your income taxes. This option is highly unlikely if you are unemployed! Pawn shop loans may not have a good reputation, however such is in fact a safer option than, say, auto title loans. Interest charges here can become very high, without mentioning the other fees that will also have to be paid for. However, if you don’t pay, seeing as you put an item up for a collateral loan, the worst that can happen is that the pawn shop takes possession of that said item. In other words, no debt collectors running after you and no losing your car!